The Mouse Hot Tub is a Physical weapon. The King provides this trap or the High Tension Spring to Hunters using the mobile app who are joining the hunt for the very first time. The Tacky Glue Trap and High Tension Spring are the two weapon choices offered to new Hunters starting the game through Facebook or the web page. Instead of harming a mouse, give it soothing place to relax before relocating it to a location far from the Kingdom. If Hunters choose a different weapon from the King when they first start playing, they can purchase the Mouse Hot Tub for 600 gold from the Town of Gnawnia Trapsmith. It refunds for 110 gold at the same location. Tacky Glue Trap – An alternate trap that Hunters can choose to receive from the King when they first begin hunting, if they start playing through Facebook or the web page. 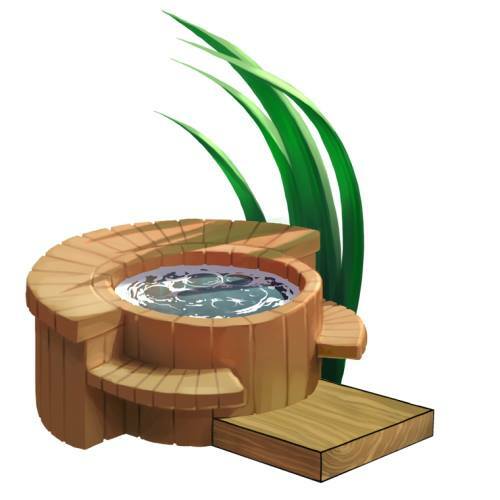 29 May 2013: The Mouse Hot Tub was introduced.